American ingenuity and craftsmanship is at the core of every item we craft – our Custom Made Lighting is built in the tradition of the Arts and Crafts movement to enhance the theme of any room. All custom ceiling lighting features genuine rawhide that is hand laced to a solid wrought iron frame. Each light is UL listed and finished with a heat applied oxide patina so your fine art lighting will never fade or rust. The American Arts and Crafts movement was popular well into the 1930s, with numerous revivals since that time. During the industrial revolution, many architects and artists felt hand work was becoming devalued and obsolete. In response, artists and architects emphasized simple forms with natural materials that were all made by hand, not machine. With the majority of items today mass-produced, it?s more important than ever to preserve the techniques that brought us the exceptional craftsmanship of the past. All lights from our craftsman collection are built by real blacksmith with solid wrought iron – no fake metal or castings. We hand-hammer each piece and apply an iron oxide heat patina finish to ensure your custom light fixture will continue to beautify with age. Our rawhide is designed to create the perfect setting so there?s no harsh light on you or your decor. 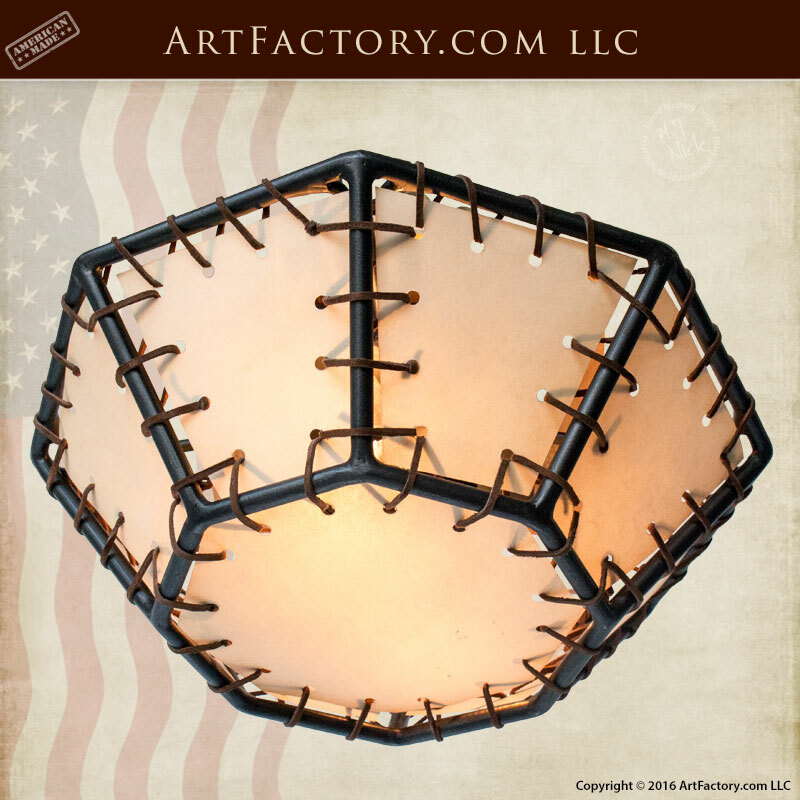 ArtFactory.com is an American manufacturer of handmade custom lighting, doors, gates, and furniture based in Scottsdale, Arizona. The founder H.J. Nick has been designing and building some of the world’s finest furnishings, all hand crafted in America, since 1913. Our clients look for that standout piece that also captures timeless elegance. We pride ourselves in creating the finest investment value furnishings available so our clients can make a proper statement reflecting their personality, or the personality of their environment. Call us now to discuss your designer lighting ideas 1-800-292-0008.